Last week we told you the release date of this project and described some its new characters, and today we would like to share a fresh Evolve video. Thus, yesterday, the new Evolve video, which in fact is the developers diary, appeared on the official video channel of the project’s publisher - 2K Games company. Here the project’s creators tell in details about such newly presented hunters as Hyde, Lazarus, Maggie and her alien dog Daisy, as well as robot Bucket. 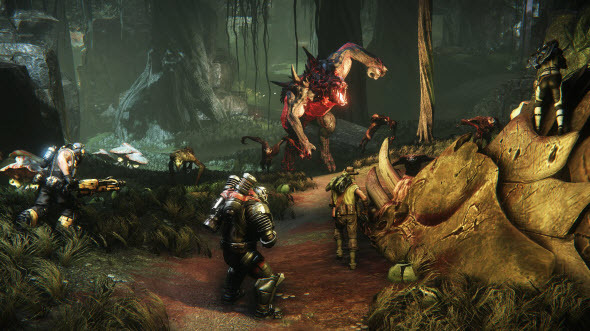 But if our previous article let you know their main abilities, then the fresh Evolve video, which lasts more than 5 minutes, shows you all these characters in action. Thus, for example, here you can see Maggie and her mate, who find a monster very quickly and masterfully use the different traps in various situations. Also you can evaluate Lazarus, the main abilities of whom are the healing and the rise of the teammates. He is very helpful, that’s why he should be careful in order not to become the first victim of the monster. Fresh Evolve video introduces us to two more characters: Hyde - the representative of the Assault class, who needs to be close to the ennemy in order to kill him, - and Bucket - an agressive robot, who is able to do a lot of things to defend his teammates. So if you are really interested in looking at these heroes in action, then we strongly advise you to watch the fresh Evolve video, published below. This shooter will hit the stores at the end of October. But if you want to get a nice bonus such as Monster Expansion Pack, which includes the first game’s add-on and Goliath's skin, then we suggest you pre-ordering this project.